Home » Sports » Look, Baseball! And then in the bottom of the frame, Josh Zeid, an unsigned pitcher who last played in the majors for Houston in 2014, fanned Mariners big boy Dae-Ho Lee to seal the victory. Israel is among the longest shots in this tournament, filled with exactly one Israeli native and a whole bunch of Jewish-American minor leaguers. Team Israel wanted the likes of Ryan Braun, Ian Kinsler, and Joc Pederson, but couldn’t convince them to sign on—especially with group play taking place in South Korea. There are some occasional big leaguers here, like Oakland catcher Ryan Lavarnway, Dodgers 1B Ike Davis, and more-or-less retired starting pitcher Jason Marquis, who threw three scoreless innings today. The flexible eligibility rules of the WBC are a feature, not a bug—anyone who is eligible for a passport from the country can play for its team, and Israel offers citizenship to anyone who has a Jewish parent or grandparent. Israel wouldn’t be able to field a team without this—there are reportedly 800 baseball players, across all age groups, in the entire country—but the point of this tournament is to bring the sport exposure it places it might not get otherwise. The later rounds are for bragging rights, and for high-quality baseball. These first-round pools are for fun, and for guys to play themselves into job opportunities, and for, perhaps, a Cinderella team—like the Dutch in 2013—to emerge. And for us to have baseball back! Who could hate this? The exhortation was part bravado, part sarcasm, part siren call. Israel is one of the lowest-ranked of the 16 teams in the World Baseball Classic that began here on Monday. Unlike the United States or the defending champion, the Dominican Republic, the Israeli squad has only a few players with major league experience. After failing to make the last tournament, in 2013, Israel had to win a four-team qualifier in Brooklyn in September to earn a berth, its first. But miracle of miracles, Israel won its tournament debut on Monday by beating South Korea, 2-1, in a game filled with walks, strikeouts and a combined 23 men left on base. 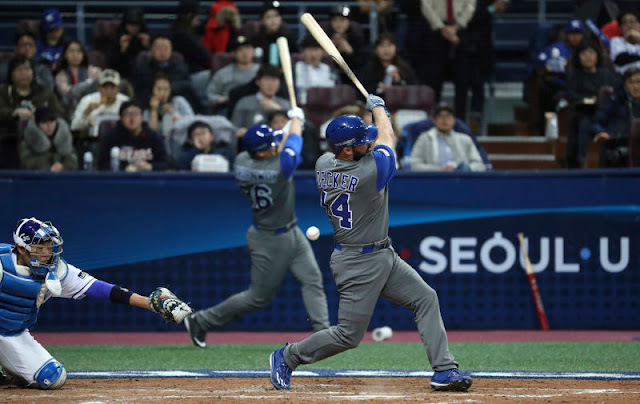 After scoring on a bases-loaded walk in the second inning, Israel struggled to advance runners until the top of the 10th, when shortstop Scott Burcham hit a ground ball that South Korean second baseman Seo Geon-chang could not handle, allowing the pinch-runner Mike Meyers to score. That gave Josh Zeid, who pitched three innings in relief, the upset victory and an emotional lift for a team tied together not only by its underdog status, but also by its heritage. Israel’s victory was all the more improbable given its roster of minor leaguers. The hope had been that once they qualified in September, the Israelis could persuade Jewish baseball stars like Ryan Braun, Ian Kinsler, Kevin Pillar and Joc Pederson to play for their ancestral homeland. But for various reasons, including the long distance to travel here, those players are either sitting out the tournament or playing for the United States, which is in a pool with Canada, Colombia and the Dominican Republic in Miami. But what Israel lacks in baseball firepower, it makes up for in pluck and humor. And though the team would have drawn more support in South Florida, in some ways, South Korea — another nation with a history of fending off neighboring countries — is an appropriate place for Israel to make its debut in the tournament, which concludes on March 22 at Dodger Stadium in Los Angeles. The team has a David-versus-Goliath feel to it. With little homegrown talent — only about 800 people in Israel are registered baseball players — the roster is filled almost entirely with American Jews, many of them free agents and minor leaguers hoping to land jobs by impressing the scouts from the United States and Asia who are following the games closely. Other than the former Mets first baseman Ike Davis, who played in only eight major league games last season, all with the Yankees, Israel has few power hitters. Instead, it will rely on the former All-Star Jason Marquis, who last pitched in 2015, and an array of relievers and scrappy position players like Fuld in an attempt to get past Taiwan, South Korea, and the strongest team in the group, the Netherlands, with the top two teams advancing to the second round in Tokyo. But under the elastic rules of the tournament, players may represent a country if they are eligible to qualify for a passport or citizenship there. In Israel’s case, that means each player must prove he has at least one Jewish parent or grandparent, or has a spouse with a parent or grandparent who is Jewish. This has helped Kurz and a team of scouts and executives cast a wide net in search of players. Ty Kelly, a utility man in the Mets’ farm system, has a Jewish mother, but went to Catholic high school and celebrated both Hanukkah and Christmas. On a tip from a fan, Kurz contacted Kelly’s minor league team in Las Vegas and confirmed that he was eligible to play for Israel. Kelly was called up by the Mets in September, so he did not play for Israel in the qualifying round that month. But he traveled to Israel with his mother, Diane, and several future teammates in January, an eye-opening experience for someone who does not speak Hebrew and who had only a loose understanding of Judaism. “I was a little skeptical how I should take it because I didn’t have a huge background growing up,” said Kelly, who joked that he could have also played for Ireland. But “everyone who is Jewish feels connected to Israel, and it was really emotional for a lot of guys seeing all the religious and historical sites,” especially the Western Wall, he said. After Alex Katz, a left-handed pitcher in the White Sox organization who played at St. John’s, wrote on Twitter that he would play for Israel, Danny Burawa, another former St. John’s player, contacted him to ask how to join. Burawa, who has bounced around the Yankees and Braves organizations, made the team after he proved his mother was Jewish. The dearth of well-known Jewish baseball stars has forced Israel to be creative. Alex Jacobs, a scout for the Houston Astros who also works as the director of player personnel for the Israelis, scoured minor league rosters for players with names that sounded Jewish. He and his colleagues, including Jonah Rosenthal, a scout with the Dodgers, then went on social media and called college coaches and anyone else who might confirm a player’s religious background. When Alex Bregman, a top Astros prospect, was called up and could not play in the qualifiers in September, Jacobs started calling synagogues in Colombia, the Dominican Republic and Panama in search of potential players. Alas, spotty record-keeping prevented Israel from landing a replacement from Latin America. Still, Jacobs has enjoyed the hunt and the chance to give back. “This is making up for me dropping out of Hebrew school,” he said, laughing. Laughter has been a key ingredient in building team spirit, and nothing has unified the team as much as the Mensch on a Bench, a Jewish version of the Elf on the Shelf, a doll that is supposed to remind children to be nice so Santa Claus will bring them a lot of gifts. The team adopted the pint-size mensch, which means an honorable person, as its mascot during the qualifying round. The players put the mensch in the dugout during games and gave it a locker of its own. The manufacturer took note and sent Decker a five-foot version of the mensch, as well as his female counterpart, Bubbe, or grandmother. The mensch was packed in a duffel bag and flown to Seoul, where he has watched over the team from the dugout, surrounded by bottles of Gatorade and gum wrappers, during practices and exhibition games. Whether the mensch will provide enough luck to propel Israel to the second round is unclear. Team Israel will face Taiwan, perhaps the weakest team in Pool A, on Tuesday. The Netherlands, with established stars like Xander Bogaerts of the Boston Red Sox, Didi Gregorius of the Yankees, Jurickson Profar of the Texas Rangers and Andrelton Simmons of the Los Angeles Angels, will be a tougher assignment for Israel on Thursday. Still, the Israeli team’s presence on the world stage can only help popularize the sport back home. No one understands this as well as Lipetz, who played on some of the first youth league teams, which were often trounced in international tournaments, and who, years ago, had to struggle to watch games on television. But, he added, what is the point of playing if you can’t dream? 0 Response to "Look, Baseball!"